HOUSTON, TX – Soldiers from the Texas State Guard's 8th Regiment put its skills and training to the test at the 30th Annual Wings Over Houston Air Show. 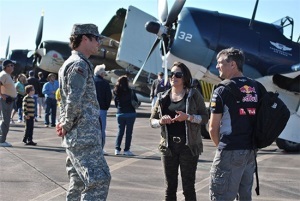 Wings Over Houston is one of the top air shows in the United States in its category and attracts festival goers from throughout Houston and around the globe. This year’s performers featured the US Navy’s Blue Angels Flight Demonstration Team which excited the crowd. This was the 28th time support has been provided to the event and the soldiers were well versed in the needs and requirements of the Texans who attended. Over 100 soldiers from the Regiment were on hand at Ellington Field to assist members of the Commemorative Air Force, and Houston Police Department with crowd safety and control. Troops manned the flight line in an effort to keep visitors out of the pathway of taxing aircraft, provided gate security, bag inspections and directional crowd control for record crowd of an estimated 95,000 visitors. 1LT Lance Herrington stated; “We were proud to be able to assist so many Texans in enjoying the show and many kids enjoyed our set up to try on military gear and get their picture taken.” Additionally members of the TXSG Medical Brigade assisted in the treatment of staff and visitors to the air show with medical needs. Overall over 3500 man hours were provided in what has become one of the biggest events of the year for the regiment. 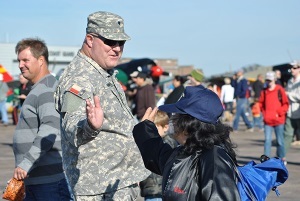 Photo Credit to: SSG Malana Nall, PAO - 8th REGT - SPC Mark Renfro receives a high five from a visitor to the 30th Annual Wings Over Houston Air Show. Photo Credit to: SSG Malana Nall, PAO - 8th REGT - PV2 Nicholas Ognanovich talks with visitors while keeping them safe from moving aircraft on the flight line of the 30th Annual Wings Over Houston Air Show.